UPDATE: We are proud to announce the formation of LDWorks, LLC, and the national and international patent-pending status of the Liquid Desiccant Waterfall !!! UPDATE: LEAFHouse was awarded an Award for Distinctive Residential Architecture in the Washingtonian / American Institute of Architects 28th Annual Awards Program. As a professional awards program, the Washingtonian magazine and the Washington Chapter of the American Institute of Architects Washingtonian Residential Design Awards Program honors distinctive residential projects, regardless of size or classification, on the basis of excellence in total design. The awards were announced in the June 2009 issue of the Washingtonian with a short article and photographs of the winning projects; certificates will be presented to the winners at the Chapter’s annual spring Garden Party. Winners will also appear in the Summer Issue of ARCHITECTUREDC Magazine. LEAFHouse didn't escape the notice of state legislators! On 01.28.08, LEAFHouse Team was invited to the Maryland State House to receive binding resolutions from the state Senate and House, commending the work of the Team. 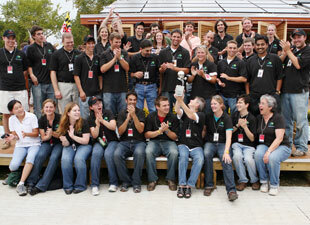 "For dedicated interest in the pursuit of advancing solar technology to improve our standard of living, we honor these students for their efforts in participating in the 2007 Solar Decathlon competition by building and displaying, on the National Mall, a livable solar home." Interested in future Decathlons? Please contact us. LEAFHouse is back on campus, in the process of being re-assembled. It will serve as the office / meeting space for the Potomac Valley Chapter of the American Institute of Architects (PVAIA). The Potomac Valley Architectural Foundation will assume stewardship of the LEAFHouse with the intent to continue the mission that the Team began - that of educating as many people as possible about Leading Everyone to an Abundant Future. 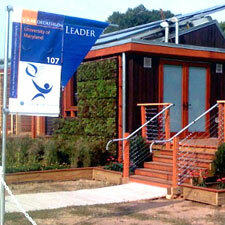 The University of Maryland is proud to be a third-time participant in the Solar Decathlon, organized by the U.S. Department of Energy’s Office of Energy Efficiency and Renewable Energy. Born of the elegant marriage of biological knowledge and cutting-edge technology, LEAFHouse, our adaptable resource-efficient house, demonstrates what happens when bioinspired design savvy, traditional know-how, and 21st-century technology join as integral parts of a sustainable lifestyle. Read our complete vision. 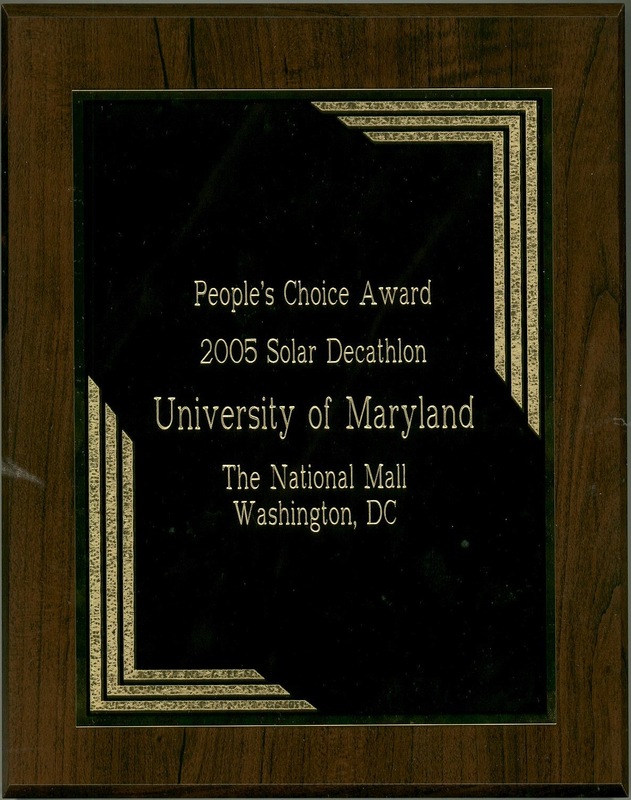 Maryland paced fourth in 2002, and won the People's Choice Award in 2005. 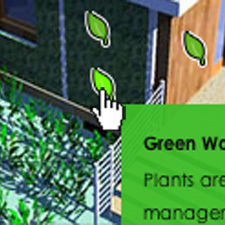 Locate products and sponsors on the interactive leaf map. 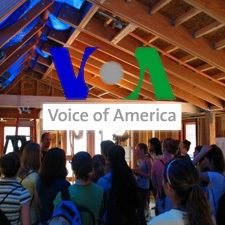 Voice of America (VOA) is the official news of the United States government. View the 2007 news video from VOA. 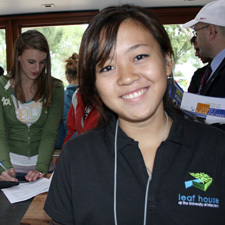 We're giving tours of LEAFHouse! 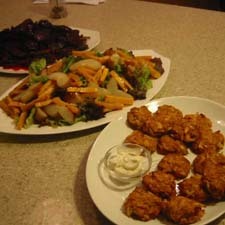 Read about the 100 Mile Meal and the top ten reasons for buying local food. University of Maryland President C.D. 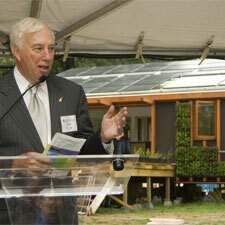 Mote spoke at the LEAFHouse send-off event on Sept. 11. Read about the University of Maryland team lobbying in the U.S. Capitol. 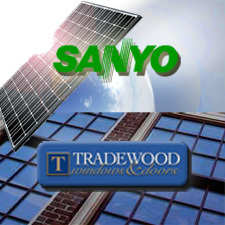 Sanyo and Tradewood donated solar panels, windows and doors.